About 8" (20.5 cm) foot circumference and 81⁄2" (21.5 cm) foot length from back of heel to tip of toe. Oaks Park may be the oldest continuously operating amusement park in America, serving as a community gathering place since 1905. It’s a modest operation that caters to all ages and pocketbooks, with carnival rides and games that operate seasonally, an indoor skating rink that’s open all year, and extensive picnic grounds along the Willamette River. This is the sock mentioned in the introduction, the one that I was knitting that caught Cat Bordhi’s attention and changed my life. I was inspired by her book Personal Footprints for Insouciant Sock Knitters, which lends itself very well to my ITR technique. If you’d like the socks to fit you perfectly, I highly recommend that you acquire Cat’s book and follow her wonderful instructions. 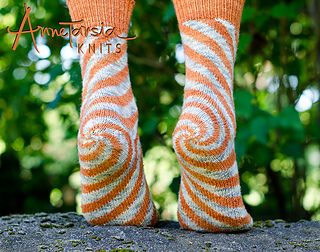 Knitting this pattern with your personal numbers may result in a sock that looks different from mine, but will be beautiful with your individual patterning.